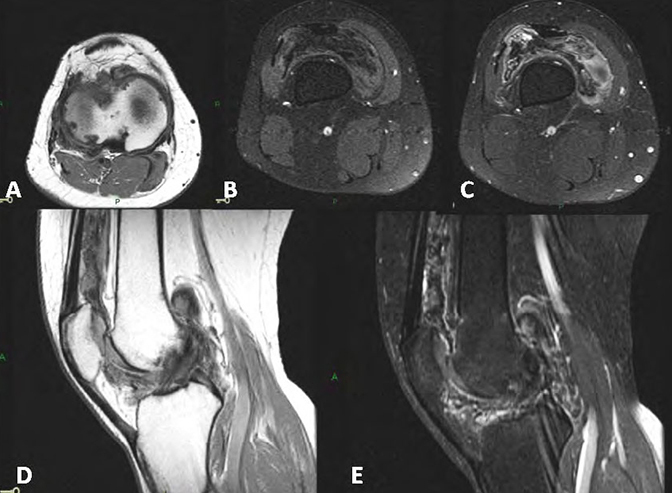 Monoarticular disease is not an uncommon clinical presentation, and the diagnosis can often be challenging due to its nonspecific clinical signs and symptoms, which include pain, joint swelling, and decreased range of motion. 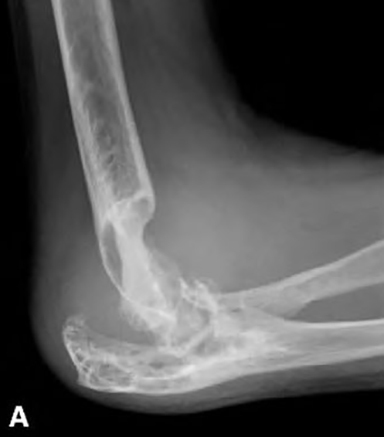 Radiography is often used initially to aid the clinician in the detection and diagnosis of monoarticular arthropathies. Because the diagnosis of these similar clinically presenting diseases may often have very different management strategies, careful review of the imaging features is necessary to narrow the list of differentials and, at times, suggest a specific diagnosis. This article will review the imaging features of the various etiologies of monoarticular arthropathy including, infectious, traumatic, crystalline, deposition, tumefactive, neuropathic, idiopathic, and foreign-body synovitis (Table 1). When presented with a monoarticular arthropathy, particularly in a patient who presents acutely with significant pain, it is essential for the clinician and radiologist to first consider an infectious etiology. In these cases, laboratory findings and joint aspiration are critical for the prompt diagnosis of the disease. Infectious arthritis refers to involvement of the joint by a microorganism; it may be divided into septic and aseptic, the former accounting for the majority of cases. Delay in diagnosing septic arthritis can lead to considerable morbidity and, in rare instances, death. The knee is the most commonly involved joint in septic arthritis, accounting for approximately 50% of cases.5 lnitially, septic arthritis may be radiographically occult. The earliest imaging findings will typically include localized soft tissue edema and joint effusion, followed shortly by peri-articluar osteopenia related to the hyperemic response to the infection. Within days, joint space narrowing will present as a result of chondrolysis from the proteolytic enyzymes released into the joint (Fig. lA).6 Focal erosions and ultimately osseous destruction will result (Fig. 2A, 2B). Findings in children may have an atypical clinical presentation or subtle radiographic findings. Ultrasound may be utilized to confirm the presence of a joint effusion and assist in image-guided aspiration when an effusion is detected (Fig. 2C) MRI is reserved for evaluation of associated soft tissue infection or abscess, as well as the detection of osteomyelitis (Fig. lB, lC). Acute or chronic post traumatic arthropathy will often manifest as a monoarticular disease. Acute traumatic arthropathy can be the result of injury to the intrinsic structures of the joint, such as the hyaline or intra-articular fibrous cartilage, to include the meniscus or labrum in the knee or shoulder, respectively. Disruption of the supporting structures of the joint, including the joint capsule or ligaments, can also be the source of traumatic arthropathy. With chronic or repetitive trauma, a pattern of osteoarthritis will develop but will be monoarticular, suggesting a secondary cause. Acute post-traumatic arthropathy will be seen as soft tissue swelling at the joint and effusion. MRI will often directly identify the specific injury which may include chondral, osteochondral, ligamentous, or capsular injury. In the chronic setting, secondary osteoarthritis at the joint will develop with radiographs or computed tomography (CT) demonstrating the typical non-uniform joint space narrowing, subchondral sclerosis, and osteophytes. Gout is a rheumatic disease which may be exhibited in up to 10% of patients with underlying hyperuricemia at some point during their lifetime.9 Isolated hyperuricemia is asymptomatic and may result from primary and secondary causes. Primary causes include inborn errors in purine metabolism or inherited defects in renal excretion of urate. Secondary causes include medications, disorders which increase nucleic acids metabolism and thus increase uric acid production, and acquired defects resulting in decreased uric acid excretion. Those who develop gout will have the deposition of monosodium urate crystals within joints or adjacent soft tissues. The stages of gout may be divided into acute, intermediate or intercritical, and chronic tophacious gout.10 The primary causes of hyperuricemia account for up to 90% of these cases.11 The imaging features of gouty arthritis will largely be dependent on where the crystals are deposited, as well as the stage of the disease. When the crystals are deposited within the articular cartilage, a nonspecific osteoarthritic pattern will result in the affected joint (Fig. 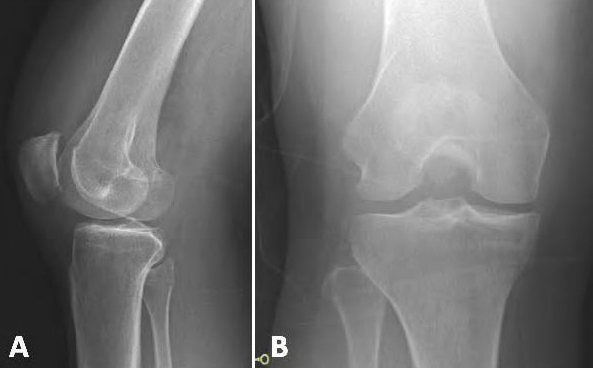 4).12 A monoarticular pattern of osteoarthritis should prompt the radiologist to consider secondary causes including post-traumatic, post-infectious, and crystalline disease. Acute gouty arthritis is often monoarticular and typically diagnosed by clinical and laboratory evaluation. When the crystals are deposited into the soft tissues, chronic tophaceous gout will often be the result. The distribution of tophaceous gout is variable and includes symmetric polyarticular disease, asymmetric polyarticular disease, and include eccentric nodular soft tissue density representing the tophus (Fig. 5). Subjacent to the soft tissue tophus, intra-articular or juxta-articular erosions will often develop. The erosions are typically eccentric with sclerotic borders. Joint spaces are preserved until late in the disease.13,14 Soft tissue tophi wilI be hyperdense on CT and variable signal intensity on MRI due to their variable tissue composition. Milwaukee shoulder presents as a rapidly progressive arthropathy of the shoulder which exhibits joint destruction, synoviaI hyperplasia, and a non-inflammatory joint effusion containing both calcium hydroxyapatite (HA) and calcium pyrophosphate dehydrate (CPPD) crystals with a large rotator cuff tear.15 This destructive arthropathy most frequently occurs in older women with clinical symptoms of pain and limited range of motion. 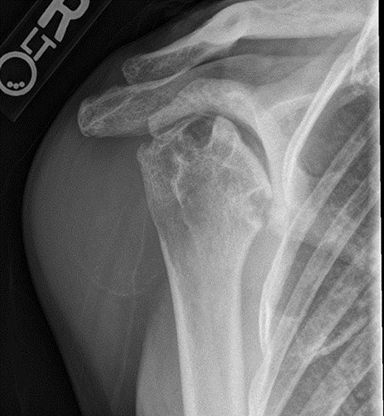 The dominant imaging feature of Milwaukee shoulder is its rapid course of joint destruction (Fig. 6). 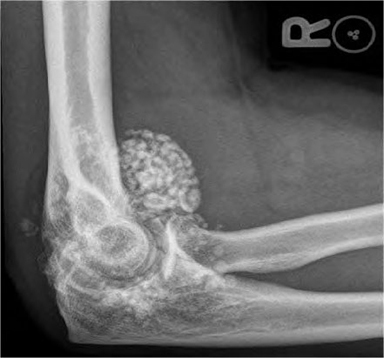 Early, there may be soft tissue swelling and peri-articular calcifications seen radiographically.10 As the disease disease progresses, the joint space becomes narrowed from chondrolysis, followed by subarticular osseous destruction. There is often capsular calcifications and intra-articular bodies. Early, MRI may reveal synovial proliferation and joint effusion with an associated full thickness rotator cuff tear. Later, the features of articular cartilage and osseous destruction are quite evident (Fig 7). Amyloids are insoluble fibrous protein aggregates. The extracellular deposition of these fibrous proteins is referred to as amyloidosis.10 Hemodialysis-associated amyloidosis is a form of amyloidosis seen with chronic renal failure. In this form of amyloidosis, the low-molecular-weight serum protein B2 microglobulin (AP2M) is not filtered by standard dialysis membranes and subsequently deposits in the musculoskeletal system.16 These patients may develop carpal tunnel syndrome and osteolytic bone lesions or amyloidomas.17,18,19 Amyloid arthopathy occurs when AP2M deposition occurs within the joint. 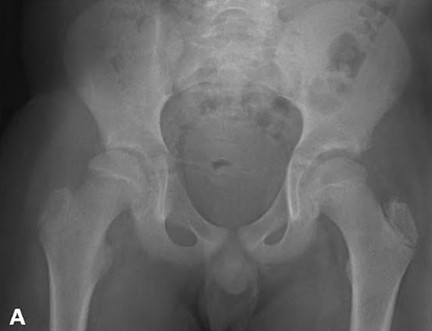 In cases of monoarticular disease, intra-articular PVNS will present with normal radiographs or may demonstrate periarticular soft tissue swelling without calcifications (Fig. 11). There is neither periarticular osteopenia nor significant joint space narrowing until late in the disease process. 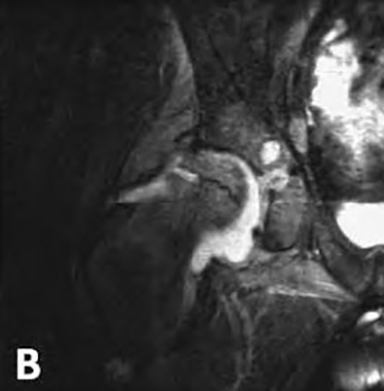 Well-defined erosions with sclerotic margins may be present in less capacious joints compared to the knee, such as the hip.33 MRI directly demonstrates low signal on all pulse sequences within the synovium representing the hemosiderin deposition (Fig. 12). First described in patients with tabes dorsalis, neuropathic arthropathy or Charcot joint may complicate disease processes which alter sensation within a joint. Although the exact mechanism is not well understood, current consensus supports the loss or diminished deep sensory innervation and proprioception, combined with repetitive trauma to the joint, as central to its pathogenesis.36 The location of involvement in neuropathic arthropathy is dependent on the underlying cause. The common neuropathic joint involvement from peripheral neuropathy secondary to diabetes mellitus or alcoholism at the foot is more typically oligo or polyarticular. Monoarticular neuropathic joint involvement is more commonly related to syringomyelia with preferential involvement of the glenohumeral joint. Radiographic features vary from an atrophic joint with total resorption to a hypertrophic joint with excessive repair.37 Early changes can overlap with osteoarthritis. As the process progresses, typicaI imaging features include fragmentation or depression of subchondral bone, sclerosis, subluxation, intraarticular osseous fragments or debris, and effusion (Fig. 13). 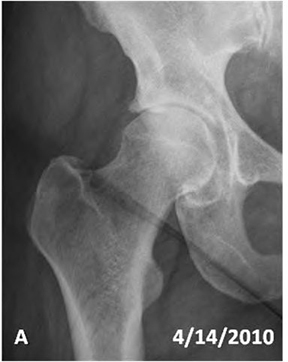 This unusual type of osteoarthritis most frequently involves the hip and is almost always monoarticular. Rapidly Progressive Osteoarthropathy (RPO) also goes by the name Rapidly Destructive Articular Disease or Rapidly Destructive Osteoarthritis, each describing the acute and destructive nature of this form of osteoarthritis (Fig. 14). RPO frequently involves older women with an average age in the seventh decade.38 These patients will have typical osteoarthritic changes elsewhere. The exact trigger or cause is not well understood. However, the common clinical symptom is a rapid clinical course of hip pain. Almost all patients will require total joint replacement due to the severity of joint damage. Early in the process, patients may be asymptomatic. Radiographically, focal lucencies adjacent to the prosthesis classically develop, representing local areas of osteolysis (Fig. 15). Radiographs may underestimate the extent of osteolysis, which can be more accurately assessed with CT.34 The patient may experience pain as osteolysis becomes increasingly more severe and aseptic loosening occurs. Ultimately, failure of the femoral and/or acetabular components may result. When this occurs, spontaneous periprosthetic fracture due to migration of the components, limb shortening, and severe pain are usually seen. Although several medical therapies have been described, surgical revision is almost always necessary to correct the defects. Metallosis occurs as an uncommon complication of joint replacements. 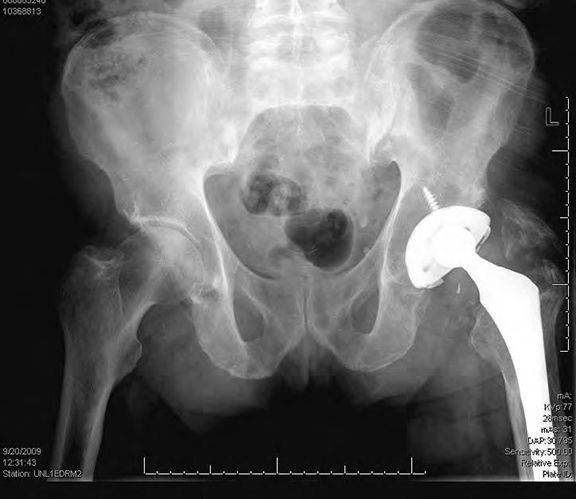 This metal synovitis may occur after failure of the interposed polyethylene surface in total knee replacements.42 More recently, this complication has been seen in metal on metal total hip replacements, where fin particles from the prosthesis produce a metal-induced chronic synovitis. Similar to particle disease, focal osteolysis occurs at the prosthesis-bone interface. 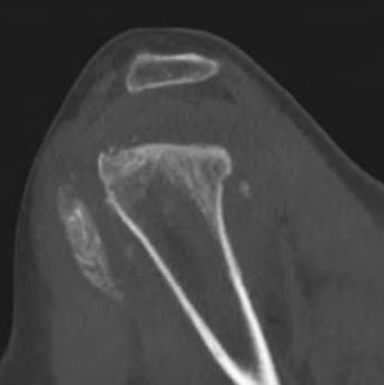 Radiographic features include fine metal particles within or outlining a distended joint (Fig. 16). These metal particles produce the low signal or susceptibility within thickened synovium on all MRI pulse sequences. Also known as prosthetic synovitis, silicone synovitis is a form of chronic foreign body synovitis caused by silicone particles which have displaced from the native prosthesis, inciting a foreign body reaction.43,44 Silicone synovitis is seen in patients with metacarpophalangeal joint implant arthroplasty or carpal implants with a silastic spacer. Radiographic findings include soft tissue edema around the joint with multiple subchondral lytic lesions exhibiting sclerotic borders across the joint (Fig. 17).44,45 The sclerotic border reflects the chronic nature of the disease, mitigating against acute process such as infection. Monoarticular arthropathy may be caused by a variety of conditions. It is important to correlate the imaging features with the clinical presentation when developing an appropriate diagnosis or list of differentials. The most important diagnosis to consider in the acute setting is septic arthritis, as delay in recognition and management may have considerable morbidity. Joint aspiration may be required for diagnostic confirmation, especially in the setting of suspected infectious or inflammatory etiologies. Understanding the imaging features of the various causes of monoarticular arthropathy is essential in aiding with diagnosis and guiding proper management of this common clinical entity. Shirtliff ME, Mader JT. 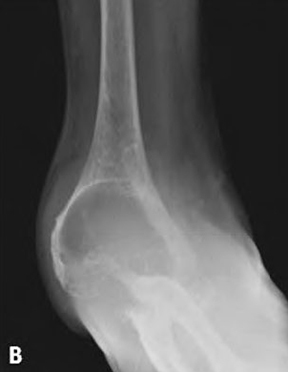 Acute septic arthritis. Clin Microbio Rev. 2002; 15(4):528. Smith JW, Piercy EA. Infectious arthritis. Clin Infect Dis 1995;20: 225-230. Resnick D, Niwayama G. Osteomylitis, septic arthritis and soft tissue infection. In: Resnick D, Niwayama G, editors. Diagnosis of bone and joint disorders, vol. 3. 4th edition. Philadelphia: WB Saunders; 2002: 2419-2435. Kaandorp CJ, Van Schaardenburg D, Krijnen P, et al. 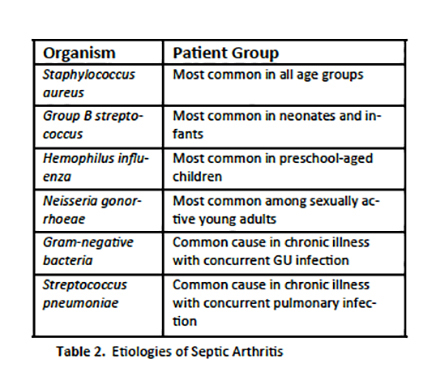 Risk factors for septic arthritis in patients with joint disease. A prospective study. 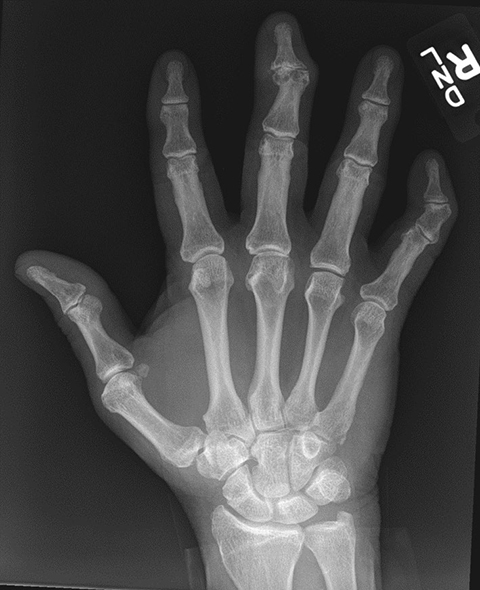 Arthritis Rheum 1995;38:1819-1825. Goldenberg DL. 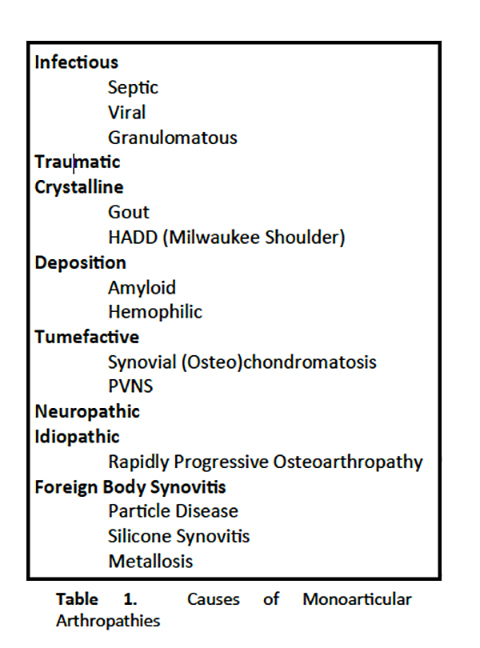 Septic arthritis [review]. Lancet . 1998, 351: 197-202. Chew FS. Inflammatory arthritis. In: Skeletal radiology the bare bones. 3rd ed. Philadelphia: Lippincott Williams & Wilkins; 2010: 223. Manadan AM,Block JA. Daily needle aspiration versus surgical lavage for the treatment of bacterial septic arthritis in adults. Am J Ther 2004;11:412-5. Berman A, Cahn P, Perez H,et al. 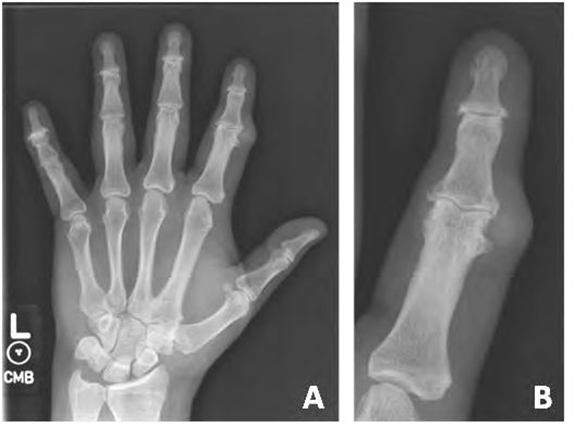 Human immunodeficiency virus infection associated arthritis: clinical characteristics. J Rheumatol 1999; 26: 1158-1162. Vitart V, Rudan I, Hayward C, et al. SLC2A9 is a newly identified urate transporter influencing serum urate concentration, urate excretion and gout. Nat.Genet 2008;40 (4):437-42. Llauge r J, Palmer J, Roson N,et al. Nonseptic monoarthritis: imaging features with clinical and histopathologic correlation. Radiographies 2000;20:S263-278. Richette P,Bardin T. Gout. Lancet 2010;375 (9711): 3 18-28. Brower AC, Flemming DJ. Gout. In: Arthritis in Black and White. 2nd ed.Philadelphia:WB Saunders Co;1997:325-341. Uri DS, Dalinka MK. Crystal disease. Radiol Clin North Am 1996; 34:359-364. Nakayama DA, Bathelemy C, Carrera G, et al. Tophaceous gout: A clinical and radiographic assessment. Arthritis Rheum 1984;27:468-471. McCarty DJ, Halverson PB, Carrera GF, et al. 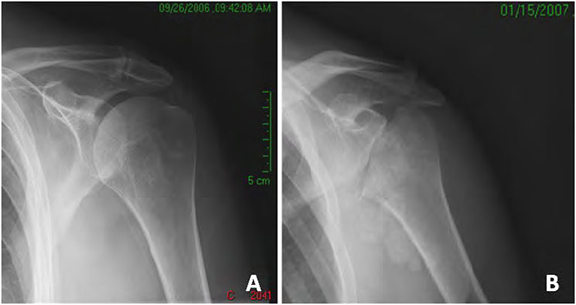 Milwaukee shoulder: Association of microspheroids containing hydroxyapatite crystals, active collagenase, and neutral protease with rotator cuff defects. Arthritis Rheum 1981;24: 464-473. Gejyo F,Odani S, Mesgarzadeh M,et al. Beta 2-microglobulin: a new form of amyloid protein associated with chronic hemodialysis. Kidney Int 1986;30: 385-390. Halter SK, Delisa JA, Stolov WC, et al. Carpal tunnel syndrome in chronic renal dialysis patients. Arch Phys Med Rehabil 1981; 62: 197 . Kumar S, Trivedi HL, Smith EK M. Carpal tunnel syndrome: complication of a arteriovenous fistula in hemodialysis patients. Can Med Assoc J 1975;113: 1070. Ross LV, Ross GJ, Mesgarzadeh M, et al. Hemodialysis-related amyloidomas of bone. Radiology 1991;157: 1023-1027. Cobby MJ, Adler RS, Swartz R, et al. Dialysis-related amyloid arthropathy: MR findings in four patients. AJR Am J Roentgenol 1991;157: 1023-1027. Yulish BS, Lieberman J M, Strandjord SE, et al. Hemophilic arthropathy: assessment with MR imaging. Radiology 1987; 164: 759-762. Burrafato V, Campanacci DA, Franchi A, et al. Synovial chondromatosis in a lumbar apophyseal joint. Skeletal Radiol 1999; 27: 385-387. Kramer J, Recht M, Deely DM, et al. MR appearance of idiopathic synovial osteochondromatosis. J Comput Assist Tomogr 1993; 17: 772-776. Maurice H,Crone M, Watt I. Synovial chondromatosis. J Bone Joint Surg 1988; 70: 807-811. Ogilvie-Harris DJ, Saleh K. Generalized synovial chondromatosis of the knee: a comparison of removal of the loose bodies alone with arthroscopic synovectomy. Arthroscopy 1994; 10:166-170. Davis IR, Hamilton A, Biggart JD. Prima ry synovial chondromatosis: a clinocopathologic review and assessment of malignant potential. Hum Pathol 1998; 29:683-688. Llauger J, Palmer J, Roson N, et al. Pigmented villonodular synovitis and giant cell tumors of the tendon sheath: radiologic and pathologic features. AJR Am J Roentgenol 1999; 172 : 1087-1091. Granowitz SP, D'Antonio J, Mankin HL. The pathogenesis and long-term results of pigmented villonodular synovitis. Clin Ort hop 1976; 114: 335-351. Myers BW, Massi AT, Feigenbaum SL. Pigmented villonodular synovitis and tenosynovitis: a clinical epidemiologic study of 166 cases and literature review. Medicine 1980; 19 : 223-238 . 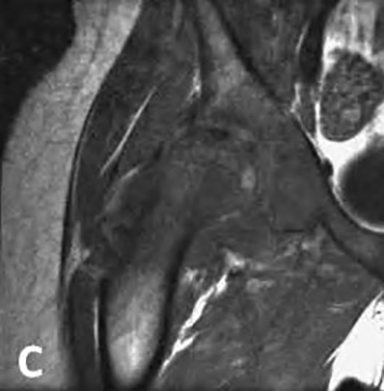 Gitelis S, Heligma n D, Morton T. The treatment of pigmented villonodular synovitis of the hip: A case report and literature review. Clin Orthop 1989; 239 : 154-160. Wagner ML, Spjut HJ, Dutton RV, et al. Polyarticular pigmented villonodular synovitis. AJR Am J Roentgenol 1981; 136:82 1-823 . Bancroft LW, Peterson JJ, Kransdorf MJ. Cysts, geodes, and erosions. Radiol Clin North Am 2004;42 :73-87. Kali RK, Unni KK. Malignancy in pigmented villonodular synovitis. Skeletal Radiol 1998;27:392 - 395. Resnick D. Neuro-arthropathy. In: Resnick D, Niwayama G, eds. Diagnosis of bone and joint disorders, 4th ed. Philadelphia: WB Saunders; 2002. p. 3564-3565. Brower AC, Flemming DJ. Neuropathic Osteoarthropathy. In: Arthritis in Black and White. 2nd ed. Philadelphia: WB Saunders Co; 1997:293. Boutry N, Paul C, Leroy X, et al. 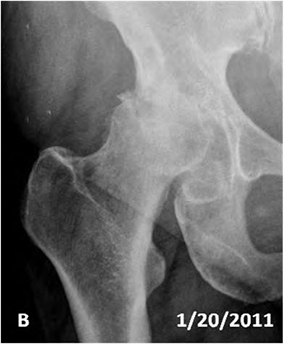 Rapidly Destructive Osteoarthritis of the Hip: MR Imaging Findings. AJR Am J Roentgenol 2002; 179(3): 657-663. Saleh KJ, Thongtrangan I, Schwarz EM. Osteolysis: medical and surgical approaches. Clin Orthop 2004; 427: 138-47. Jones LC, Hungerford DS. Cement disease. Clin Orthop 1987; 225:192-206. Schmalzried TP, Jasty M, Harris WH. 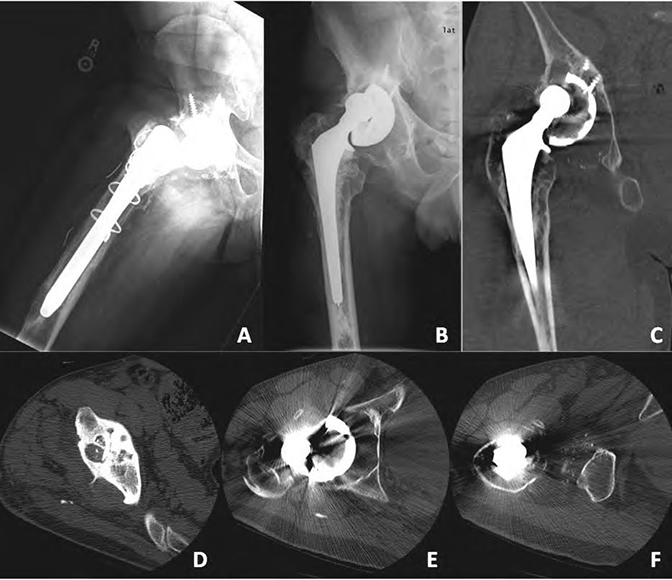 Periprosthetic bone loss in total hip arthroplasty. Polyethylene wear debris and the concept of the effective joint space. J Bone Joint Surg Am 1992; 74(6):849-63. Chew FS, Ramsdell MG, Keel SB. Metallosis after total knee replacement. AJR Am J Roentgenol 1998; 170: 1556. Goldman AB, Bansal M. Amyloidosis and silicone synovitis. Radiol Clin North Am 1996; 34: 375-394. Weissman BN. Imaging of Joint Replacement. In: Resnick D, Niwayama G, eds. Diagnosis of bone and joint disorders, 4th ed. Philadelphia: WB Saunders; 2002. 636-38. Murry PM, Wood MB. The results of treatment of synovitis of the wrist induced by particles of silicone debris. JBJS Am 1998; 80:(3)397-406. Cerniglia CA. Imaging Features of Monoarticular Arthropathies. J Am Osteopath Coll Radiol. 2013;2(4):14-25.